Tears of the TFCC can be caused by injury, such as a fall or in sport, these are called traumatic tears. 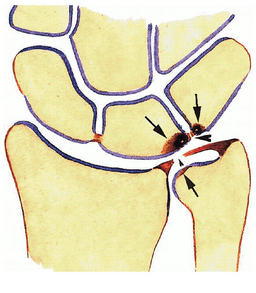 TFCC tears may also occur due to the wearing down of the joint over time, these are called degenerate tears. 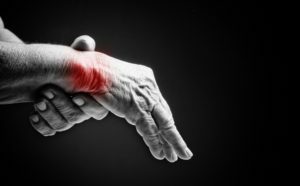 Patients may experience pain, weakness and restriction of movement in the wrist. Pain can be felt when attempting to put weight on the wrist such as when getting out of a chair. The pain can be a background dull pain made worse on movement resulting in a sharp pain. The first step is to undergo a consultation, involving a medical history and clinical examination. Mr Naqui usually organises further tests such as an x-ray or MRI scan. These may help to identify the extent of any associated arthritis or bone displacement and the extent of the tear. Treatment will depend on the underlying cause and extent of tear. Initially conservative measures will be explored first including pain relief medication, splints and wrist strengthening physiotherapy. The TFCC will be assessed by key-hole, arthroscopic wrist surgery. This is also helpful in assessing the rest of the joint and is more accurate than an MRI scan. Depending on the type and location of the tear, it maybe repaired or debrided (cleaned by cutting away any injured tissue and removing any debris). The wrist will be placed in a splint following the surgery for between 2 and 6 weeks, depending on whether the TFCC was repaired. Any sutures inserted in the skin will be removed at around 10 days. Mr. Naqui and the hand therapist will then provide you with specific exercises to perform to regain strength and movements of the wrist. This will be early on after the operation.